Neuroblastoma (NB) is the most common extracranial solid tumor in childhood and the most common cancer in infancy. While the disease is generally curable, long-term survival for children older than 18 months of age presenting with advanced disease is quite poor despite aggressive treatment. 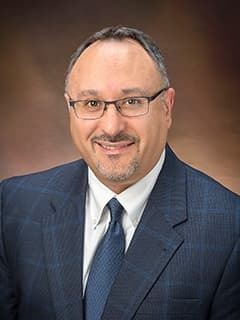 Hamid Bassiri, MD, PhD, and researchers at the Center for Childhood Cancer Research are using preclinical tumor cell-based assays and mouse models to evaluate drugs that interfere with polyamine synthesis and assess their effects on cancer cell growth and immune function in the tumor microenvironment. In neuroblastomas, polyamine metabolism is coordinately deregulated and is thought to support neuroblastoma progression by possibly suppressing immune function in the tumor microenvironment. Using preclinical models, several polyamine synthesis inhibitors have been identified, and one (difluoromethylornithine; DFMO) is to be evaluated in upcoming pediatric clinical trials as a treatment for neuroblastoma. Ultimately, these preclinical models will be used to better understand the molecular mechanisms of interactions between the tumor microenvironment and immune cells. This understanding will help inform the design of future pediatric trials to improve immune cell activity against neuroblastoma.